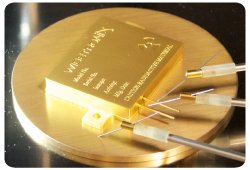 Widetronix is commercializing betavoltaic power sources as well as betavoltaic enabled electronic devices. We currently offer engineering prototypes and custom research devices to qualified customers. We have two models of this device, the T and N, which are housed in a power electronics package (right) comprised of a metal package plated with gold. This seam sealed package provides sufficient shielding and prevents radioactive material from escaping. The electric current flows out of the two leads connected to the package sidewall. Firefli-T: is designed to meet a customer specific voltage and current profile. The design flexibility allows for the betavoltaic to produce 10’s to 100’s of nanowatts and run for years or decades depending on application. The Firefli-T uses tritium (12.3 year half-life) that has been locked into a metal foil. The amount of tritium contained in the package ranges from 25 mCi to 2.5 Ci. The initial power output for the device can be set to 10 nW to 1 µW, with the open circuit voltage set in 2V increments, typically ranging from 2V to 6V. Firefli-N: This device is configured in the same way as the Firefli-T, except that the isotope used is Nickel-63 (100.1 year half-life). The Nickel-63 is plated on to a foil and the amount contained in the package ranges from 5 mCi to 500 mCi. The initial power output for the device can be set to 5 nW to 500 nW, with the open circuit voltage set in 2V increments, typically ranging from 2V to 6V. 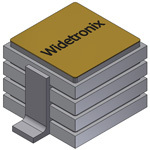 Widetronix is releasing a surface mount package in mid-2013. The custom ceramic surface mount package is designed specifically for use with betavoltaics and is 10 mm x 8.5 mm x 2mm. The low profile package is hermetically seam sealed, providing protection from radiation exposure and contamination. In addition it can be stacked vertically (below), which allows for increased power output while minimizing footprint. 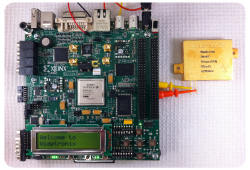 Widetronix has successfully integrated our betavoltaics with electronic devices and has developed two other products that can run autonomously for more than 25 years. 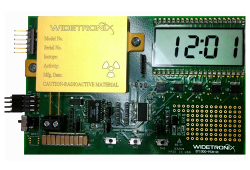 The first is the Widetronix Real Time Clock (RTC). Our betavoltaic power source is able to run the clock and can communicate with electronics via standard I2C or SPI communication. The RTC is equipped with a watch-dog timer, which can enable a microcontroller to remain in sleep mode, conserving power, until the betavoltaic enabled RTC wakes it up for activity. In addition, the betavoltaic provides certainty that the clock will function for years, beyond that of conventional battery power sources. Widetronix has also combined their betavoltaic power source with a microcontroller called a Power Burst Controller (PBC). The betavoltaic provides the power to run it in sleep mode and then periodically wake it up to perform specific functions. This is ideal for duty cycled applications that need to perform limited computations on a periodic basis. The microcontroller can be combined with sensors and RF or RFID components to collect, store, and transmit data. The development opportunities with this device are endless since the power is being maintained by the betavoltaic and therefore the lifetime of the overall device can span for decades. If you have any product related questions concerning the above information, please use our web form on our contact page to enable a discussion about the possibility of acquiring betavoltaics.